Register to vote: If you’re eligible to vote in North Carolina, make sure you’re registered to vote at your current address, and register to vote (or update your registration) if you need to. Connect with us: Sign up for our email list (the form is on the sidebar of this page) and follow us on Facebook and Twitter for the latest news & information. Connect with your precinct: Use our easy Precinct Finder tool to find out which precinct you’re in and connect with your local Democrats. Join us at our meetings: We meet every month on the fourth Monday evening of the month. Consider running for office. In America, our government officials aren’t a special class of people… they’re us, ordinary citizens like you and me who stepped up and ran for office. Every election year, far too many positions at the local, state, and national level go to the Republicans simply because no Democrats stepped up to the plate to run. We need everyone to pitch in. 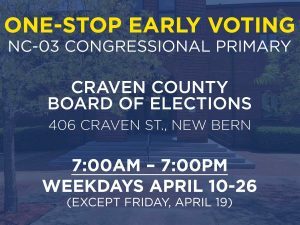 If you run for office as a Democrat in Craven County, we’ll do everything we can to bring you to the finish line.